All of this is presented through music that sounds like lullabies for The Addams Family. The combination of minor key organ and piano, tinkertoy percussion, and the cold, short-range vocals combine to form a compelling off-kilter pop sensibility. The nearest I can come to describe it is the pop-sensibility of Takako Minekawa mixed with the sinister overtones of The Residents in their Duck Stab period–or possibly the their Goosebumps songs. However, it’s Chelsea’s vocals that really complete the package. The childlike tones evoke the innocence necessary to make the simple lyrics work. In another Residents comparison, her voice is reminiscent of long-time Residents collaborator Molly Harvey’s vocals on songs from Demons Dance Alone. If there’s a weakness to the childlike style and themes, it’s that sometimes the music and the lyrics can be a bit too simple. Many of the song lyrics rely on those basic moon/June/spoon rhymes and the stories they tell can lean bit too hard towards simplistic moralizing. It’s possible this was a deliberate stylistic choice, and when it works it works well. It leaves a lot of depth that can be explored in future albums–and I eagerly await their arrival. 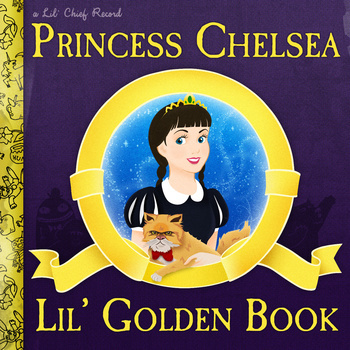 I can’t wait to hear what happens when Princess Chelsea gets a chance to hone her craft and make something even more amazing and distinct. The promotional materials describe Lil’ Golden Book as stories of “growing up in modern New Zealand,” but like those Golden Books, they’re more universal than one might imagine. Richard J. Anderson is a writer based in Philadelphia, PA. He blogs at SansPoint, and also keeps track of neat things from the internet at Want a Breath Mint.